Several years ago Milestone Imports was contacted by a frustrated shopping center owner in Illinois. 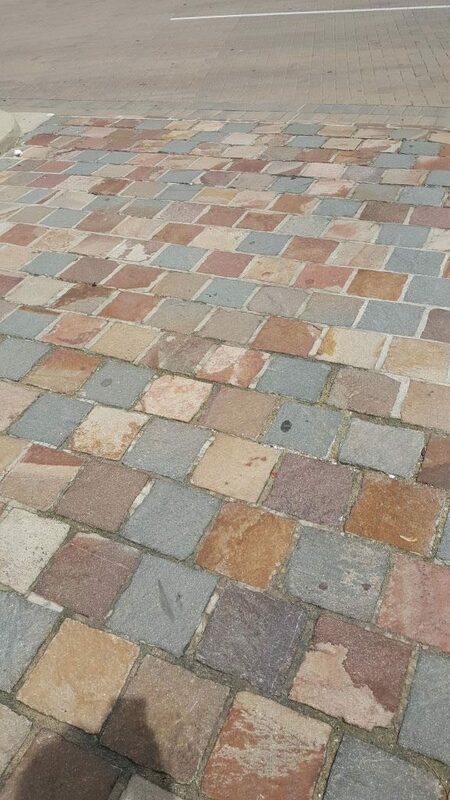 He had purchased Porphyry pavers for a center he was improving. After just one very cold winter his installation was beginning to fail. For Milestone Imports, GftK sanded epoxy Jointing Mortar was the clear choice. 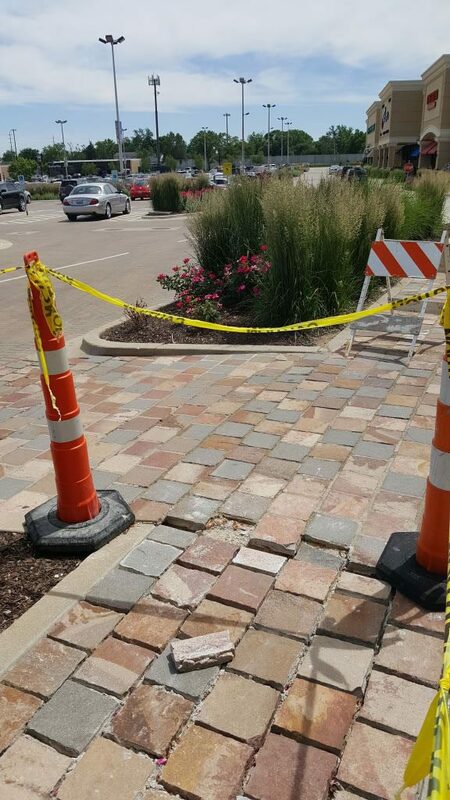 The jointing material was degrading allowing the sand set stones to move and wobble; creating not only an eyesore for shoppers but a potential hazard. We talked about it a bit and it was decided that I should come out to take a look to see if I had any ideas on fixing the problem. On a cold, windy day in October I flew out to take a look. We learned the installer had used a cement based mortar and after a harsh Winter and a Spring with freeze thaw cycles it had begun to crack, leaving gaps and was visibly disintegrating. The cracks and gaps had allowed moisture to get into the installation causing havoc in the freeze thaw cycles. Hazardous walkway due to original grout failure after freeze thaw cycle. 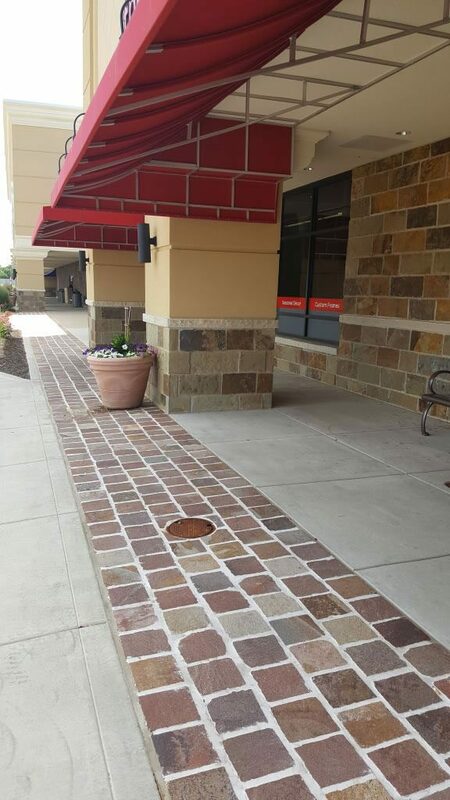 Shopping Center grout failure after just one winter. This was unacceptable on many levels, safety being first! We dug up a test area and determined that the sub-straight needed a little extra support and depth. We decided on a 12” minimum depth compacted to 95%. We used a #8 aggregate sand with a 1-3 mixture of cement to sand on top of the sub-straight for a leveling bed and re-set the pavers. As this needed to be repaired as soon as possible we used a concrete mixed with a latex additive for the jointing material. Not the best solution but the best solution at hand. The following Spring, I contacted them to find out that the area we had worked on was still in good shape but the rest was even worse. In addition to our test area, they had tried several other products after I left; including, Polymeric Sand and a white latex product that were now failing. 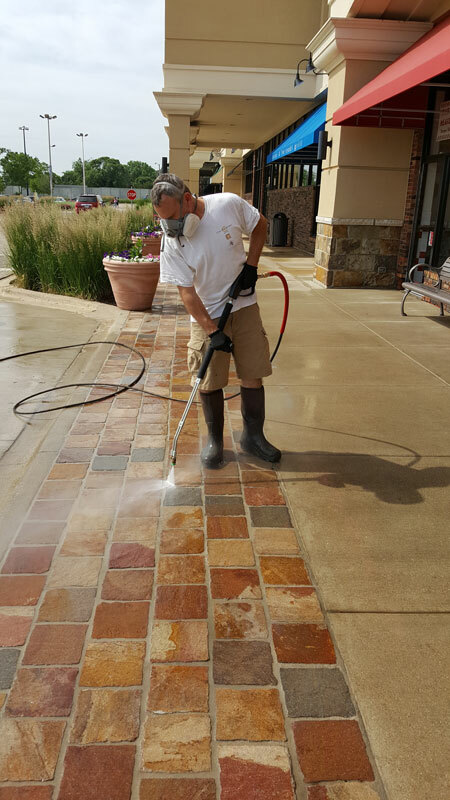 White latex grout which also began to fail for the shopping center after freeze/thaw cycles. Polymetric sand which could not withstand the elements year-round. Neither product could hold up to the winter, de-icing salts and the power washing required to clean the exterior surfaces at the center. After talking to the maintenance staff it was noted that these products popped out of the joints or broke down with the pressure washing. At this point I suggested a German sanded epoxy jointing mortar that has been used for years throughout Northern Europe and the Scandinavian countries designed specifically for unit paving stones in harsh, heavy traffic areas. We shipped out a test pallet consisting of 9 buckets of Gftk vdw 850 jointing mortar in a natural sand color. The installation and cleanup process impressed the installer because of its simplicity and ease. The Installers like the fact that it can be installed in temperatures as low as 38 degrees, in the rain if necessary and sets up very quickly. The product comes in 5 gallon pails with part A treated sand and a part B bottle of the hardening agent. After mixing it thoroughly in the bucket it is poured over pre-wetted pavers and using a squeegee worked into the joints. As it starts setting up a soft push broom is used to remove any excess product. It is then hosed off as the final cleaning process. After several more small pallets and another winter the conclusion was to order much more. They really liked the performance and the look. 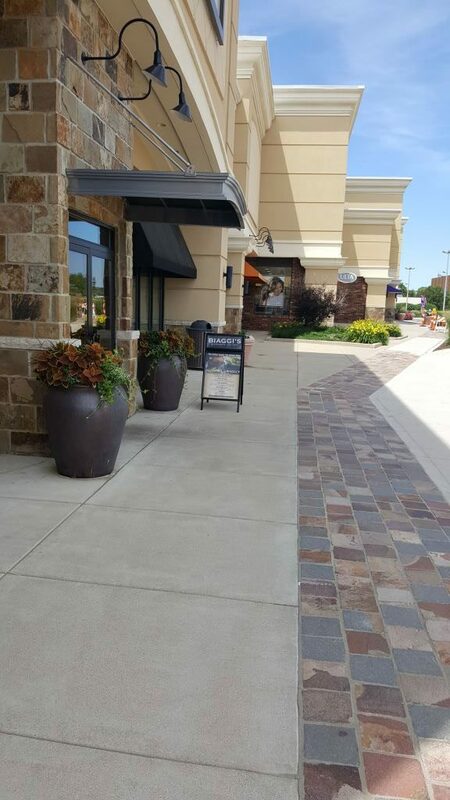 The product is non shrinking, non-shiny, and with the choice of the natural sand color it worked well with the shopping center’s Porphyry colors. Being resistant to freeze thaw conditions and de-icing salts just helped to make the decision. 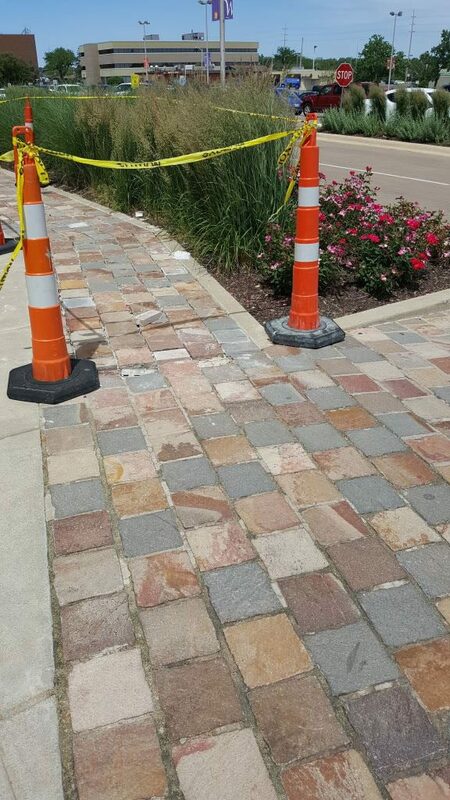 GftK 850 successfully wintered without cracking or loosening around the pavers. Excellent color match and sturdy installation of the new GftK jointing mortar. In addition to the look and safety upgrade, it was a big success with the maintenance crew as this solution can be power washed, saving them time. For roadways it is also resistant to mechanical sweepers! The GftK vdw 850 has 3,626 psi and a flexural strength of 1,450 psi. 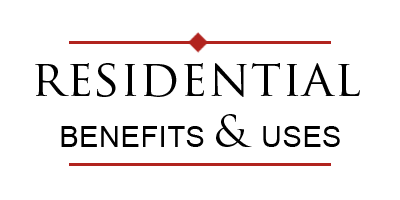 The flexural qualities work well with its ability to bond to the stones, metal drains and concrete curbs, each with their own different expansion rates in different weather. Our jointing mortar is very tough, tenacious stuff designed for long lasting durability in the most challenging conditions. 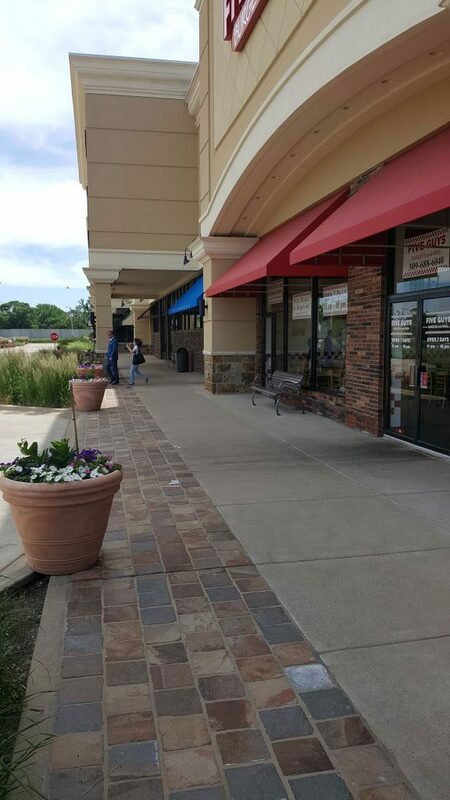 The shopping center owner is now enjoying years of beautifully set pavers without the hassle of constant repairs or safety concerns. Find out if GftK sanded epoxy jointing mortar is right for your next project here.